Yes, it’s a corny tagline, but it also happens to be absolutely true. Geek Bar Chicago‘s menu preview event at Mad River this past Monday night provided a tantalizing peek at what Chef Tom Kern, mixologist Laura Green and the Geek Bar kitchen and bar staff have in store for the scores of hungry geeks waiting at the gates. The preview menu consisted of four dishes, two cocktails and one “mocktail” – unfortunately I didn’t get to try all three cocktails, but it had been a long day and taking it easy on the booze was a responsible choice to make (I’ll have plenty of chances to whoop it up at Geek Bar soon, I promise). 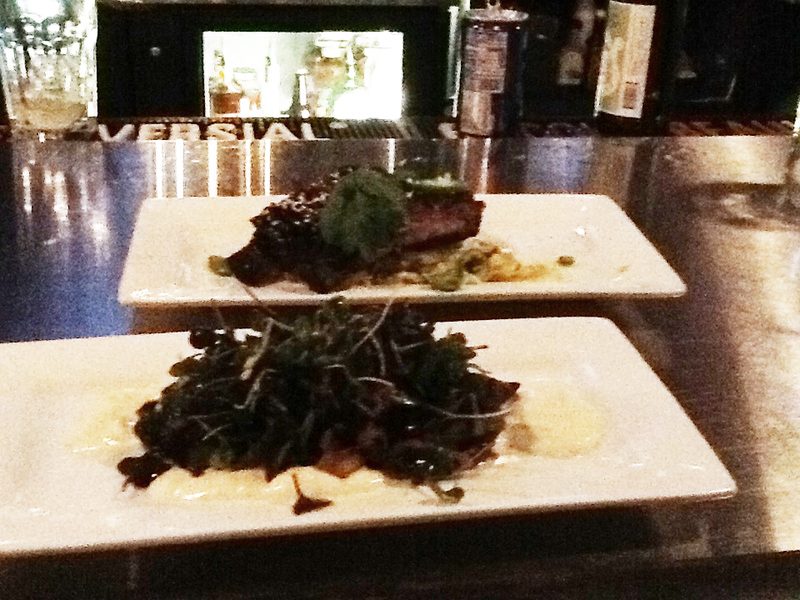 Overall, I was impressed with the creativity in Chef Kern’s dishes. His passion for food shows through the care and imagination he puts onto each plate. Of the four dishes, two stood out as clear winners for me: the Littlefingers – crab and chorizo corn dogs with lime aioli, and chili-tomato puree; and Dragon Ribs – smoked pork ribs, glazed with hot chili, and served with an eastern sesame slaw. The Littlefingers were coated in the perfect amount of batter – a crisp covering that was just thick enough to provide the right contrasting crunchy texture to the soft interior of savory crab and chorizo. I’m already a sucker for food on a stick, and these were a nice size – big enough to sate one’s appetite while waiting for the main course, but not so much that you’ll fill up before getting to the main event. Although I wouldn’t mind making those corndogs my main dish – just throw in a salad with a tangy vinegarette and you’d have a fine meal. Nobody saw me scooping out the last of that aioli with my fingers, right? The Dagobah Fondue – brussels sprouts, smoked cauliflower, and celery root mousse, and Goomba-bella – grilled portabella with a citrus crema, roasted pepper, and herbs, were good, but didn’t quite manage to hit all the right notes. While I’m a happy meat-eater, I did marry a partner who eschews meat, fish and all things dairy, so I always pay attention to vegetarian and dairy-free dishes when assessing whether or not an eatery is one I can enjoy with my husband. Of the two, I preferred the fondue – the dish was well-seasoned and I found the mousse (which was so light it was arguably more foam than mousse) to be an enjoyably playful element. 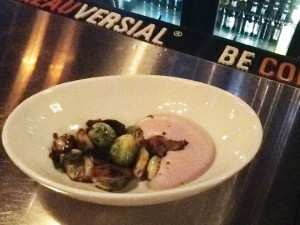 The sprouts were nicely caramelized, although I tend to prefer mine to be a bit more tender. I did find myself wishing for something salty, like crisp bacon or pancetta, or perhaps a light dusting of shredded parmesan, to complete the dish. The Goomba-bella was probably my least favorite of the four. I generally love mushrooms – if a dish has maitake listed as an ingredient, it’s a good bet I’ll order it. I didn’t find anything wanting with the flavor in the dish – whatever the sauce used to glaze the mushrooms in was an amazing balance of smokey, salty and umami, which blended nicely with the rich, subtly-citrus crema. I’m very much a texture-based eater, however, so with the sauteed mushrooms on top of the roasted peppers, on top of the crema, there was a little too much soft-on-soft-on-soft in the dish. While the microgreens added a bright note, I would have preferred something to add a little crunch and contrasting texture to the roasted vegetables. Crispy leeks, perhaps? As for the ribs… I’m actually not much of a ribs person. They tend to be too fatty and (there’s that texture thing again!) too squishy soft for my preferences – I tend to like my meat lean (I’m a filet mignon person rather than a ribeye person). So when I say that in quick succession, I was gnawing on those bones to get every last bit of meat while making vaguely Stitch-like sounds, I hope you take my meaning to be that those ribs were damn good. According to David Zoltan, Geek Bar’s CEO/President (and full disclosure, a good friend), they went with the St. Louis style ribs because they’re meatier, with more evenly distributed fat marbling, which in turn renders more evenly through the meat, which tends to be a bit tougher than the softer, more tender loin ribs. The ribs were coated with that finger-licking, crispy-chewy-sticky caramelized glaze, which paired perfectly with the fresh, bright notes in vegetable slaw. If I have one complaint about the ribs, it’s that they weren’t nearly spicy enough for me, but considering I’m that person who douses practically everything in hot sauce, it’s probably just me. Although Geek Bar, if you were to give diners the option of making those ribs “Mild, Medium, Spicy or Dragon’s Fire,” I don’t think people would protest. Of the three drinks, I was able to try the Hyrule and Liniya. The latter involved vodka, ginger-orange and lime-angostura ice cubes with a splash of soda. You can’t ever really go wrong with vodka and citrus, and the ginger added a nice little bite. But the Hyrule – pineapple, lime, jalapeño, cilantro, ginger beer, soda – is something I could drink all day (it had me at jalapeño and pineapple). And I would have, if it hadn’t been for the fact that I decided to go the “add booze” route without realizing that the “Veritaserum” was actually tequila, and there’s a really good reason tequila and I are not on speaking terms. 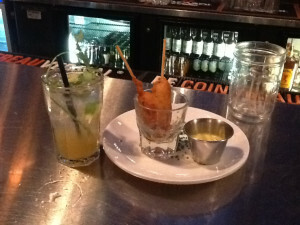 Maybe next time I can get them to add rum to it instead of tequila. Sadly, I did not get to try the District 12 – moonshine, earl grey, vanilla, torched mini marshmallows on a stick, but judging by the frequency with which they were flying from behind the bar, I will have to order one when Geek Bar Opens. The marshmallows are on fire when the drink is served. For that reason alone I need to try one. *Speaking of Wonka’s, if I have one criticism of the event, it’s that we didn’t get any sampling of what Geek Bar’s dessert menu will be like! 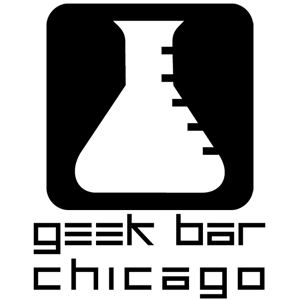 This means that Geek Bar Chicago is going to hold a dessert menu preview before opening as well, right? RIGHT? This entry was posted in Food, Review and tagged cocktails, Dragon Ribs, Geek Bar Chicago, menu, preview, tasting by Michi Trota. Bookmark the permalink.